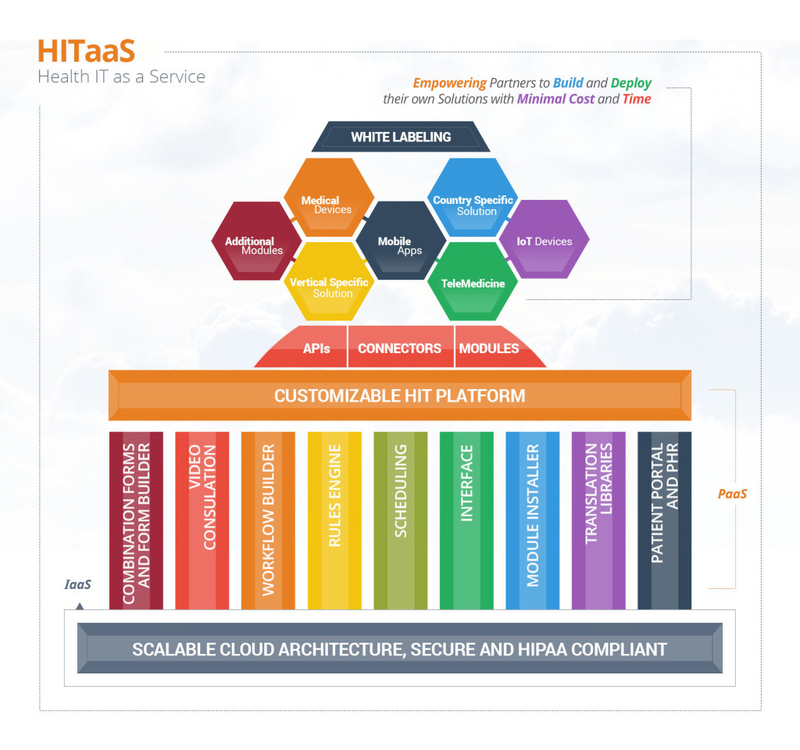 HITaaS (Health IT as a Service) is a Healthcare dedicated cloud based service that sits over infrastructure as a service (IaaS) and software as a service (SaaS). HITaaS manages all aspects of infrastructure, security, runtime, middleware, OS, virtualization, Servers, storage, contracts, and interfaces. Among its components are fully built software modules that can be customized without coding. Agility, scalability, limited need for expertise, easy deployment, and reduced cost and development time. Customize existing modules without coding. Develop their own modules and add them to the solution using the module installer. Monetize solutions in the module marketplace by offering them to other users of the system. Develop independent apps using APIs that leverage the features of HITaaS. Create different combinations and permutations to deliver effective solutions with specific building blocks provided on the platform. The HITaaS diagram outlines the components of the system and how they work together. ZH Healthcare (ZH) is the leading developer of the most popular open source Electronic Health Records (EHR) system in the world, OpenEMR. This open source solution is currently being downloaded at a rate of over 1,400 times per week. Many of these downloads are initiated by people who seek a customized solution either to use for themselves or to take to market. Armed with the knowledge of the end user’s objectives and with the understanding that open source is not for everyone, ZH created a platform that is customizable and flexible with a set of tools and modules that can be configured or assembled by the end user in little time and effort. blueEHR is established on a secure and regulatory compliant, scalable cloud based architecture, and has the convenience of a “pay as you go model”. A modern HIT platform offers scalable architecture, a secure system with disaster recovery and backup of sensitive and critical information, along with basic EHR components which include interfaces, e-prescriptions, interoperability, portals, billing system, telemedicine platforms… and the list goes on. It is the vision of ZH to deliver health IT that is affordable, user friendly, and accessible to facilitate better health outcomes for the global population. To complete this goal, costs for innovating solutions must be driven down. HITaaS is a step in that direction. Technology has advanced to the point where it has the capacity to help billions of people across the world. Governments, organizations, and entrepreneurs are all looking at opportunities in the Health IT industry to deliver better health outcomes through applications and technology solutions to the world’s 7 plus billion people. Building and deploying a complex health IT solutions is not the same as starting e-commerce business in a garage. The healthcare industry the world over operates in a highly regulated environment. This, along with the inherent scale and complexity of delivering global solutions, drives up the potential cost and time to market. The spectrum of EHR and Health IT needs is vast. Modern day EHR solutions have to be customized for different verticals, organizations, and countries. The solutions also need to adhere to disparate rules and regulations. An effective solution needs to integrate with various devices, and organizations. Build a solution from scratch. This path could cost millions and take a long time to develop. Large organizations may have the capacity for this path, though it may not be the most efficient use of capital and resources, especially considering in many cases redeveloping basic e-health systems generates very little meaningful IP. Adopt an open source solution. While open source EHR systems are available, they are not always the best solution. While open source eliminates the time to market to a reasonable degree, it does not necessarily provide a dependable solution, nor a complete one, for a mission critical solution that is supported by a stable company. You still have to spend a lot of time customizing the solution and further costs to guarantee updates and support. Use a proprietary solution. Proprietary solutions can be cookie cutter, inflexible, and designed to not work that well for 80% of the market. Customizing these solution can also be costly and time consuming. HITaaS with blueEHR provide: Agility, scalability, limited need for expertise, easy deployment, and reduced cost and development time.